This section discusses known problems or issues when using replication with NDB Cluster 7.5. Loss of master-slave connection. A loss of connection can occur either between the replication master SQL node and the replication slave SQL node, or between the replication master SQL node and the data nodes in the master cluster. In the latter case, this can occur not only as a result of loss of physical connection (for example, a broken network cable), but due to the overflow of data node event buffers; if the SQL node is too slow to respond, it may be dropped by the cluster (this is controllable to some degree by adjusting the MaxBufferedEpochs and TimeBetweenEpochs configuration parameters). If this occurs, it is entirely possible for new data to be inserted into the master cluster without being recorded in the replication master's binary log. For this reason, to guarantee high availability, it is extremely important to maintain a backup replication channel, to monitor the primary channel, and to fail over to the secondary replication channel when necessary to keep the slave cluster synchronized with the master. NDB Cluster is not designed to perform such monitoring on its own; for this, an external application is required. The replication master issues a “gap” event when connecting or reconnecting to the master cluster. (A gap event is a type of “incident event,” which indicates an incident that occurs that affects the contents of the database but that cannot easily be represented as a set of changes. Examples of incidents are server crashes, database resynchronization, (some) software updates, and (some) hardware changes.) When the slave encounters a gap in the replication log, it stops with an error message. This message is available in the output of SHOW SLAVE STATUS, and indicates that the SQL thread has stopped due to an incident registered in the replication stream, and that manual intervention is required. See Section 8.8, “Implementing Failover with NDB Cluster Replication”, for more information about what to do in such circumstances. Because NDB Cluster is not designed on its own to monitor replication status or provide failover, if high availability is a requirement for the slave server or cluster, then you must set up multiple replication lines, monitor the master mysqld on the primary replication line, and be prepared fail over to a secondary line if and as necessary. This must be done manually, or possibly by means of a third-party application. For information about implementing this type of setup, see Section 8.7, “Using Two Replication Channels for NDB Cluster Replication”, and Section 8.8, “Implementing Failover with NDB Cluster Replication”. However, if you are replicating from a standalone MySQL server to an NDB Cluster, one channel is usually sufficient. Circular replication. NDB Cluster Replication supports circular replication, as shown in the next example. The replication setup involves three NDB Clusters numbered 1, 2, and 3, in which Cluster 1 acts as the replication master for Cluster 2, Cluster 2 acts as the master for Cluster 3, and Cluster 3 acts as the master for Cluster 1, thus completing the circle. 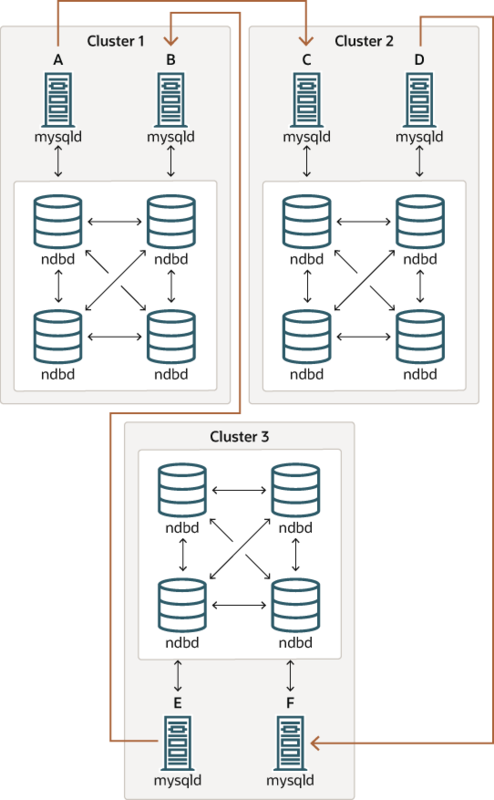 Each NDB Cluster has two SQL nodes, with SQL nodes A and B belonging to Cluster 1, SQL nodes C and D belonging to Cluster 2, and SQL nodes E and F belonging to Cluster 3. The NDB storage engine uses idempotent execution mode, which suppresses duplicate-key and other errors that otherwise break circular replication of NDB Cluster. This is equivalent to setting the global slave_exec_mode system variable to IDEMPOTENT, although this is not necessary in NDB Cluster replication, since NDB Cluster sets this variable automatically and ignores any attempts to set it explicitly. 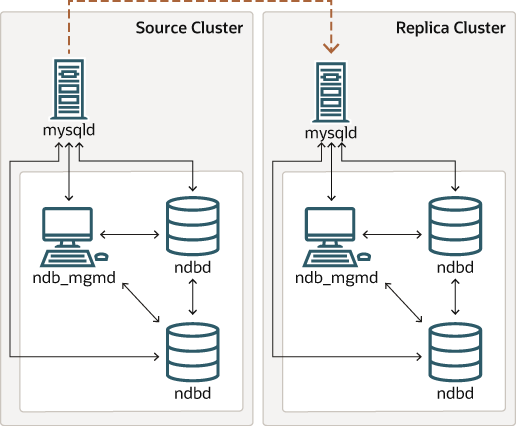 NDB Cluster replication and primary keys. In the event of a node failure, errors in replication of NDB tables without primary keys can still occur, due to the possibility of duplicate rows being inserted in such cases. For this reason, it is highly recommended that all NDB tables being replicated have primary keys. NDB Cluster Replication and Unique Keys. In older versions of NDB Cluster, operations that updated values of unique key columns of NDB tables could result in duplicate-key errors when replicated. This issue is solved for replication between NDB tables by deferring unique key checks until after all table row updates have been performed. Deferring constraints in this way is currently supported only by NDB. Thus, updates of unique keys when replicating from NDB to a different storage engine such as MyISAM or InnoDB are still not supported. However, the same statement failed with a duplicate key error or other constraint violation on the slave, because the ordering of the row updates was done for one partition at a time, rather than for the table as a whole. Every NDB table is implicitly partitioned by key when it is created. See KEY Partitioning, for more information. GTIDs not supported. Replication using global transaction IDs is not compatible with the NDB storage engine, and is not supported. Enabling GTIDs is likely to cause NDB Cluster Replication to fail. Multithreaded slaves not supported. NDB Cluster does not support multithreaded slaves, and setting related system variables such as slave_parallel_workers, slave_checkpoint_group, and slave_checkpoint_group (or the equivalent mysqld startup options) has no effect. This is because the slave may not be able to separate transactions occurring in one database from those in another if they are written within the same epoch. In addition, every transaction handled by the NDB storage engine involves at least two databases—the target database and the mysql system database—due to the requirement for updating the mysql.ndb_apply_status table (see Section 8.4, “NDB Cluster Replication Schema and Tables”). This in turn breaks the requirement for multithreading that the transaction is specific to a given database. Restarting with --initial. Restarting the cluster with the --initial option causes the sequence of GCI and epoch numbers to start over from 0. (This is generally true of NDB Cluster and not limited to replication scenarios involving Cluster.) The MySQL servers involved in replication should in this case be restarted. After this, you should use the RESET MASTER and RESET SLAVE statements to clear the invalid ndb_binlog_index and ndb_apply_status tables, respectively. Multi-master and circular replication are not supported (tables on both the master and the slave must use the NDB storage engine for this to work). Using a storage engine which does not perform binary logging for slave tables requires special handling. Use of a nontransactional storage engine for slave tables also requires special handling. The master mysqld must be started with --ndb-log-update-as-write=0 or --ndb-log-update-as-write=OFF. The next few paragraphs provide additional information about each of the issues just described. Multiple masters not supported when replicating NDB to other storage engines. For replication from NDB to a different storage engine, the relationship between the two databases must be a simple master-slave one. This means that circular or master-master replication is not supported between NDB Cluster and other storage engines. In addition, it is not possible to configure more than one replication channel when replicating between NDB and a different storage engine. 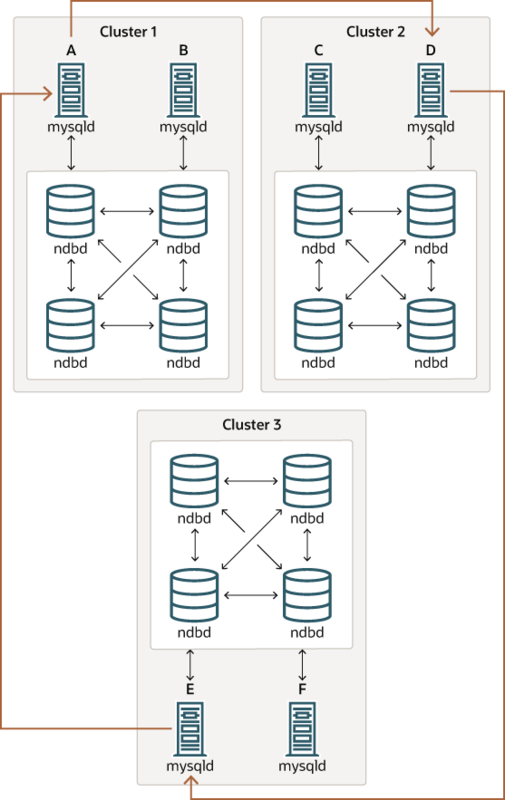 (However, an NDB Cluster database can simultaneously replicate to multiple slave NDB Cluster databases.) If the master uses NDB tables, it is still possible to have more than one MySQL Server maintain a binary log of all changes; however, for the slave to change masters (fail over), the new master-slave relationship must be explicitly defined on the slave. Turn off binary logging on the slave. This can be accomplished by setting sql_log_bin = 0. Change the storage engine used for the mysql.ndb_apply_status table. Causing this table to use an engine that does not handle its own binary logging can also eliminate the conflict. This can be done by issuing a statement such as ALTER TABLE mysql.ndb_apply_status ENGINE=MyISAM on the slave. It is safe to do this when using a non-NDB storage engine on the slave, since you do not then need to worry about keeping multiple slave SQL nodes synchronized. Filter out changes to the mysql.ndb_apply_status table on the slave. This can be done by starting the slave SQL node with --replicate-ignore-table=mysql.ndb_apply_status. If you need for other tables to be ignored by replication, you might wish to use an appropriate --replicate-wild-ignore-table option instead. You should not disable replication or binary logging of mysql.ndb_apply_status or change the storage engine used for this table when replicating from one NDB Cluster to another. See Replication and binary log filtering rules with replication between NDB Clusters, for details. Replication from NDB to a nontransactional storage engine. When replicating from NDB to a nontransactional storage engine such as MyISAM, you may encounter unnecessary duplicate key errors when replicating INSERT ... ON DUPLICATE KEY UPDATE statements. You can suppress these by using --ndb-log-update-as-write=0, which forces updates to be logged as writes (rather than as updates). Using --replicate-do-db=db_name (and no other --replicate-do-* or --replicate-ignore-* options) means that only tables in database db_name are replicated. In this case, you should also use --replicate-do-db=mysql, --binlog-do-db=mysql, or --replicate-do-table=mysql.ndb_apply_status to ensure that mysql.ndb_apply_status is populated on slaves. Using --binlog-do-db=db_name (and no other --binlog-do-db options) means that changes only to tables in database db_name are written to the binary log. In this case, you should also use --replicate-do-db=mysql, --binlog-do-db=mysql, or --replicate-do-table=mysql.ndb_apply_status to ensure that mysql.ndb_apply_status is populated on slaves. Using --replicate-ignore-db=mysql means that no tables in the mysql database are replicated. In this case, you should also use --replicate-do-table=mysql.ndb_apply_status to ensure that mysql.ndb_apply_status is replicated. Using --binlog-ignore-db=mysql means that no changes to tables in the mysql database are written to the binary log. In this case, you should also use --replicate-do-table=mysql.ndb_apply_status to ensure that mysql.ndb_apply_status is replicated. Its own --replicate-do-* or --replicate-ignore-* option, and that multiple rules cannot be expressed in a single replication filtering option. For information about these rules, see Replication and Binary Logging Options and Variables. Its own --binlog-do-db or --binlog-ignore-db option, and that multiple rules cannot be expressed in a single binary log filtering option. For information about these rules, see The Binary Log. If you are replicating an NDB Cluster to a slave that uses a storage engine other than NDB, the considerations just given previously may not apply, as discussed elsewhere in this section. However, all connections originating within the NDB Cluster —represented in the preceding diagram by solid arrows—must use IPv4. In other words, all NDB Cluster data nodes, management servers, and management clients must be accessible from one another using IPv4. In addition, SQL nodes must use IPv4 to communicate with the cluster. Since there is currently no support in the NDB and MGM APIs for IPv6, any applications written using these APIs must also make all connections using IPv4. Attribute promotion and demotion. NDB Cluster Replication includes support for attribute promotion and demotion. The implementation of the latter distinguishes between lossy and non-lossy type conversions, and their use on the slave can be controlled by setting the slave_type_conversions global server system variable. For more information about attribute promotion and demotion in NDB Cluster, see Row-based replication: attribute promotion and demotion. NDB, unlike InnoDB or MyISAM, does not write changes to virtual columns to the binary log; however, this has no detrimental effects on NDB Cluster Replication or replication between NDB and other storage engines. Changes to stored generated columns are logged.